Cemetery of the St. Peter Lutheran-Evangelical Congregation. Capital city of Russia. Antonio Sanchez, a Spanish Jew and member of the Academy of Sciences, lived in St. Petersburg in the reign of Elizabeth Petrovna. In the reign of Catherine II. there were three or four Jews in the city, though legally they were not permitted domicil there (comp. Nevakhovich, Löb; Notkin, Nathan; Peretz, Abraham). From that time the number of Jewish inhabitants increased gradually, until, at the beginning of the nineteenth century, there was a substantial group of Jews living in the city. Synagogue at Saint Petersburg, Russia. The Ḥasidic rabbi Shneor Zalman of Lody was for a time confined in the fortress of St. Petersburg during the reign of Paul I. Seeing that the rabbi would not eat any of the prison fare, the commandant sent for Mordecai of Lepla to prepare his food according to the Mosaic law. At that time therewere other Jews living in St. Petersburg, among them Löb Mianevich and Saul of Sizochina. By 1802 these had already effected a communal organization. Not possessing a cemetery of their own, they entered into an agreement with the St. Peter Lutheran-Evangelical congregation of St. Petersburg, whereby the latter allowed the Jews the use of a division of its extensive burial-grounds. In the minutes of the church meeting of Feb. 2, 1802, the following is recorded: "At to-day's meeting of the church elders three Jews appeared with a request for a piece of ground in the Bretfeld cemetery, to be used for the burial of their dead. The elders, having considered this request, decided to assign to them a place for burial beyond the wall of our cemetery, on the right side of the brook, and occupying 160 square 'sazhens,' on condition that there shall be paid to St. Peter's Church 10 rubles for every person buried there. The road to this plot must be constructed at their own expense, and in such a manner as to cause no inconvenience to us; they are not forbidden, however, to carry their dead through our cemetery." A copy of these minutes was placed, under date of April 1, 1802, in the register of the Jewish community. "To preserve the memory of the persons, now living here, who received this document," says the register, "their names are hereby appended: the respected and honored Nathan Notkin of Shklov; Ḥayyim Shmukler of Brod; Osher, son of Isaiah Katz of Moghilef; Mordecai, son of Shpraga-Faivish of Shklov; Mattithiah, son of Jonas Katz; Judah, son of Ozer of Shklov; Eliezer, son of Gershon of Novomyesto; Isaac, son of Nathan Segal of Moghilef; Joshua, son of Ḥayyim of Shklov; Shabbethai, son of the respected Nathan Notkin." It appears from the records that, numerically, the Jews of Shklov occupied the first place in the community, and that those from Moghilef were next. The records of the burial association contain the names of a number of Jews buried in the cemetery, among them that of Avigdor, son of David Chakhechover of Warsaw, who confessed to the authorities before his death that he was a Jew and expressed a wish to be buried in the Jewish cemetery. A similar notice occurs of Joseph, son of Benjamin Bunem. He was from Germany, and was a member of the Imperial Band. The last entry in this record is dated Jan. 31, 1822, and tells of the burial of the "famous rabbi and renowned physician Moses Elhanan Elkan of Tulchin." The burial-plot secured from the Lutheran congregation in 1802 was filled by 1862, the last to be buried there being the Wilna publisher David Romm. An additional plot was then assigned to the Jewish community by the German congregation, and was used until 1874. In that year another piece of ground, in the Preobrazhenski cemetery, was assigned by the city to the Jews for burial purposes. While still forbidden by law to reside in St. Petersburg, the Jews there increased in number, thanks to the tolerant attitude of Alexander I., who highly appreciated the services rendered by the Jews in the war of 1812. The governor-general of St. Petersburg, Miloradovich, was very friendly toward the Jews, and designated them as the "most faithful of the emperor's servants." The treatment of the Jews in St. Petersburg underwent a change for the worse in the reign of Nicholas I. Many of the Jewish families living in that city were given the alternative of baptism into the Greek-Orthodox Church or banishment. A number were baptized, and some of these were given government positions, to influence, perhaps, the conversion of other Jews. One of these baptized Jews became the favorite secretary of Nicholas I.; another, Feigin, was the right-hand man of Kankrin. 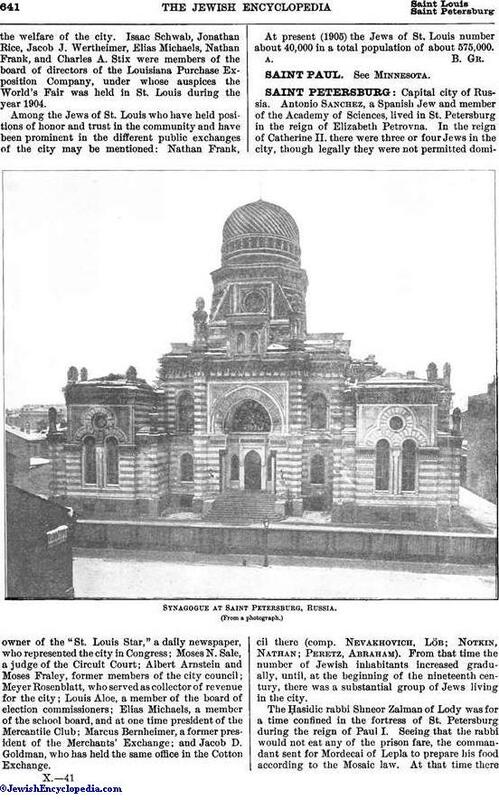 Permission to build the present synagogue was given in 1869, but owing to legal difficulties it was not opened until 1893. For its livelihood the Jewish population of St. Petersburg depends chiefly upon the following occupations: making clothes and shoes, 25.2 per cent; working in metal, 8.8; literature, 6.2; the practise of medicine, 4.9. 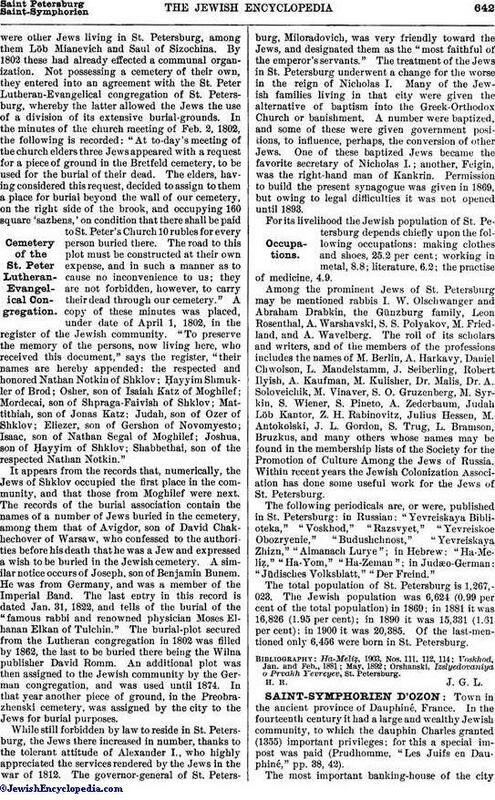 Among the prominent Jews of St. Petersburg may be mentioned rabbis I. W. Olschwanger and Abraham Drabkin, the Günzburg family, Leon Rosenthal, A. Warshavski, S. S. Polyakov, M. Friedland, and A. Wavelberg. The roll of its scholars and writers, and of the members of the professions includes the names of M. Berlin, A. Harkavy, Daniel Chwolson, L. Mandelstamm, J. Seiberling, Robert Ilyish, A. Kaufman, M. Kulisher, Dr. Malis, Dr. A. Soloveichik, M. Vinaver, S. O. Gruzenberg, M. Syrkin, S. Wiener, S. Pineto, A. Zederbaum, Judah Löb Kantor, Z. H. Rabinovitz, Julius Hessen, M. Antokolski, J. L. Gordon, S. Trug, L. Bramson, Bruzkus, and many others whose names may be found in the membership lists of the Society for the Promotion of Culture Among the Jews of Russia. 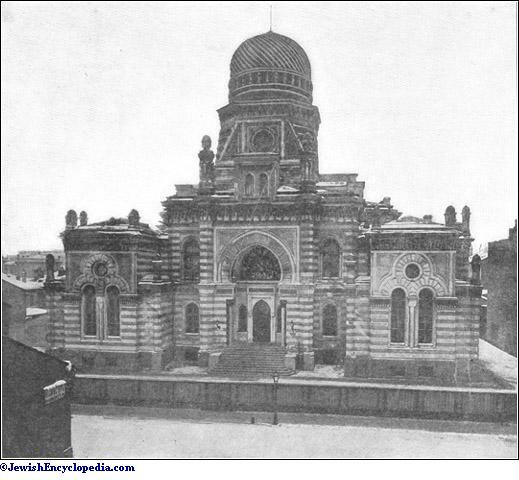 Within recent years the Jewish Colonization Association has done some useful work for the Jews of St. Petersburg. The following periodicals are, or were, published in St. Petersburg: in Russian: "Yevreiskaya Biblioteka," "Voskhod," "Razsvyet," "Yevreiskoe Obozryenie," "Budushchnost," "Yevreiskaya Zhizn," "Almanach Lurye"; in Hebrew: "Ha-Meliẓ," "Ha-Yom," "Ha-Zeman"; in Judæo-German: "Jüdisches Volksblatt," "Der Freind." The total population of St. Petersburg is 1,267,023. The Jewish population was 6,624 (0.99 per cent of the total population) in 1869; in 1881 it was 16,826 (1.95 per cent); in 1890 it was 15,331 (1.61 per cent): in 1900 it was 20,385. Of the last-mentioned only 6,456 were born in St. Petersburg. Orshanski, Izslyedovaniya o Prvakh Yevreyev, St. Petersburg.